Glashutte has crafted a timepiece marked with its dream-like elegance with sparkling diamonds that line the 18ct rose gold bezel for an effortless touch of luxury. The mother of pearl dial features Glashutte's signature cloud-inspired effect with clear Roman numerals that imbue the watch with more of a classical feel. The date aperture sits at the 6 o'clock mark for easier timekeeping. 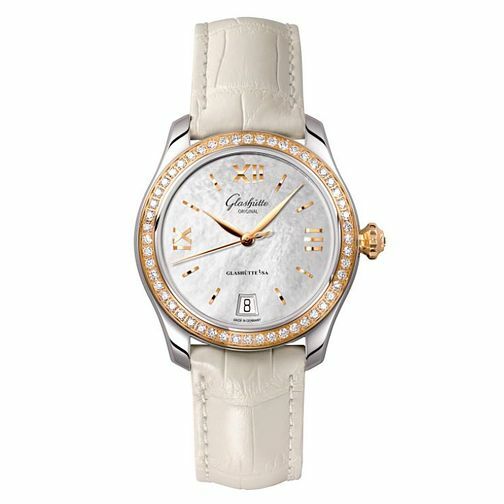 The overall look is finished with a pearl-coloured stitched strap that compliments the dial for a luxurious statement.